SYA, as in Save-Your-A$$ financing. As I've said ad nauseum, the manner in which a company raises money tells me a lot about the health of that business. 15-year debt raised at sub-five percent rates? Love it. Selling common stock at a 30% discount with a truckload of warrants (options to purchase shares)? Hate it. 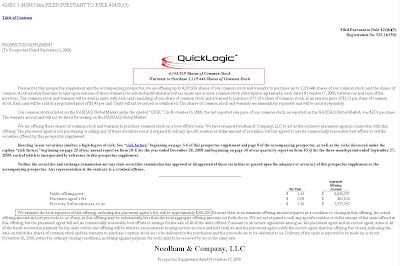 Quicklogic (QUIK) is a fabless (they do the design, and outsource the production) semiconductor company in Sunnyvale, CA. 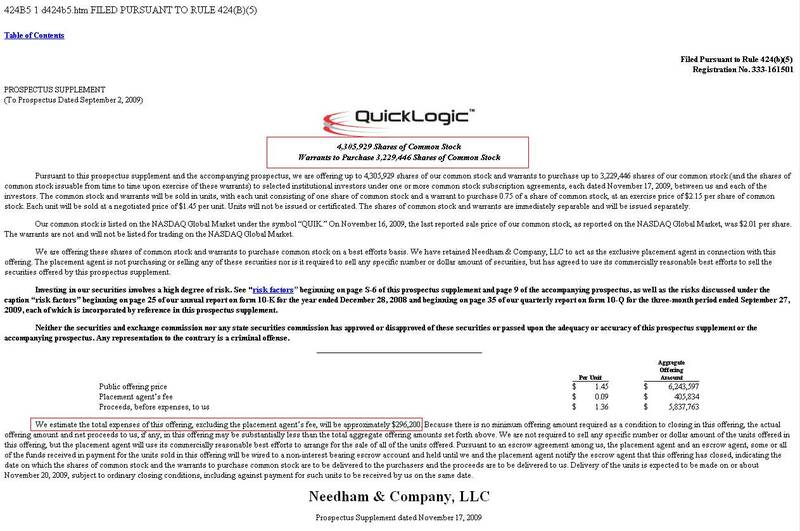 SUNNYVALE, Calif.--(BUSINESS WIRE)--QuickLogic Corporation (NASDAQ:QUIK - News), the lowest power programmable semiconductor solutions leader, today announced that it has entered into definitive agreements with a select group of institutional investors to sell an aggregate of 4,305,929 shares of common stock and warrants to purchase up to an aggregate of 3,229,446 shares of common stock in a registered direct offering. The common stock and warrants will be sold in units (the “Units”), with each Unit consisting of (i) one share of common stock and (ii) a warrant to purchase 0.75 of a share of common stock, at a negotiated purchase price of $1.45 per Unit. The Company expects to receive gross proceeds from the offering of approximately $6.24 million, before deducting placement agent’s fees and estimated offering expenses. The Company’s costs in connection with the offering are expected to be approximately $0.7 million. The Warrants are exercisable any time after the six month anniversary of the date of issuance until the 66 month anniversary of the date of issuance, and will be exercisable at a price of $2.15 per share. Well I'll give them credit - at least the exercise price on the warrants is above the offering price!(sarcasm). There's nothing wrong with selling stock after it's run up like QUIK shares have - in fact it's better longer-term than shackling the company with debt payments. But there's selling stock and there's SELLING STOCK. In addition to infuriating recent buyers with today's huge haircut, the warrants indicate that this was either a tough sell or a gift to "special" investors. Adding insult to injury is the I-banking and legal fees associated with this deal, pushing costs OVER 10%!! Not good, and not shareholder friendly. In the recently reported second quarter, Quicklogic reported new "product revenue" was up 67%, so hopefully as this ramps we will see the cash burn rate (about $1.8million last quarter) slow down, and maybe some profitability in future quarters. They had $13million(ish) in cash, but apparently figured they needed some more. Hopefully results in future quarters will let investors put this offering in the rear view mirror, but for now it certainly does not reflect well on management's stewardship of investor capital.